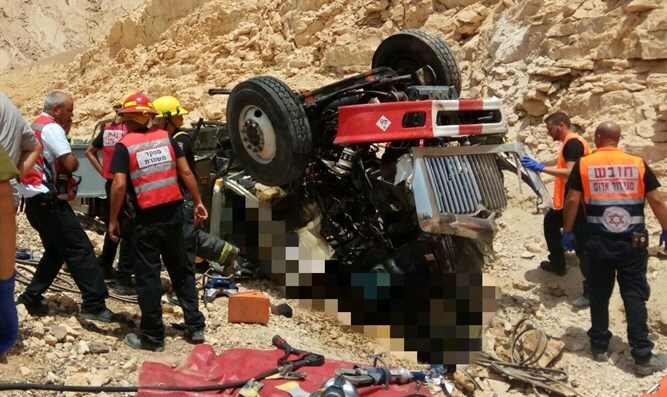 Two 20-year-olds killed after truck overturns north of Eilat. Road blocked in both directions. Two youths were killed Thursday afternoon when a truck overturned on Route 12, about 3 miles north of Eilat. MDA teams and IDF medical teams who rushed to the scene of the difficult accident provided medical treatment for the two injured 20 year-olds, whose condition was initially defined as critical. After efforts proved unsuccessful, the two young men were confirmed dead at the scene. The bodies were extricated from the truck by firefighters. As a result of the accident Route 12 was blocked to traffic in both directions between Eilat and the Sayarim junction.